The regulation of gun ownership remains a contentious issue in U.S. politics. 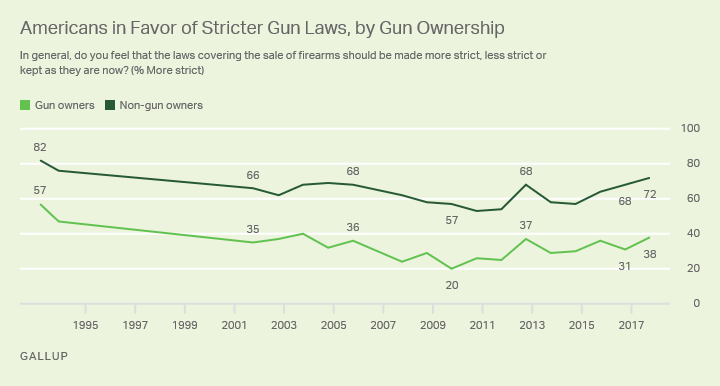 We at Gallup have recently published a series of articles detailing the American public's views on a number of issues related to gun control, underscoring the complexity of these attitudes. Elected officials reviewing public opinion will find, in general, that a majority of Americans support the concept of stricter gun control, but that support varies widely depending on the specifics. Support is high for universal background checks, mandatory gun registration and a 30-day waiting period for all gun sales -- but much lower for bans on specific types of guns. Only a minority of voters care deeply enough about gun laws that it would be totally determinative of their vote for a political candidate. For opponents of stricter regulation, the argument that new gun laws might not have the intended effect of lowering the incidence of mass shootings is an apparently potent obstacle to passing new laws. 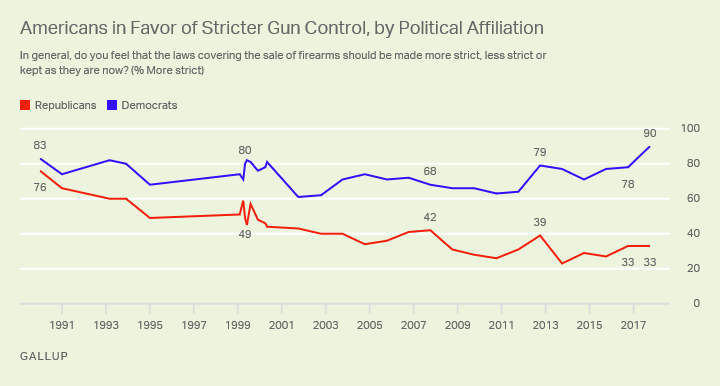 Support for stricter gun control laws remains firmly in majority territory, with the 60% currently in favor representing the highest percentage since 2004. This latest measure came shortly after the Las Vegas shooting that left over 50 dead. Support for stricter gun laws is predictably, but increasingly, partisan. The divide on gun laws between Republicans and Democrats has grown wider over the past 15 years (as is the case with many other issues). The current data: 33% of Republicans say gun laws should be stricter, compared with 90% of Democrats. This is a 57-percentage-point gap -- the largest in Gallup's trend, which began in 1990. There is a predictable divide between gun owners and non-gun owners on stricter gun laws, but it is not as wide as the partisan gap. The gun owner/non-gun owner gap over time has been relatively constant -- between 25 and 38 points. Gallup's current survey shows that 29% of U.S. adults personally own a gun; an additional 14% live in a gun-owning household. The "stricter gun laws" question is broad -- and could cover a wide variety of restrictions and bans. In fact, Americans' support for three specific restrictions on guns exceeds the generic 60% "stricter gun laws" level. These include nearly universal support (96%) for required background checks, 75% support for a 30-day waiting period for all gun sales and 70% support for all guns to be registered with local police. In contrast, Americans' support for outright bans falls below the 60% "stricter" baseline. Banning the possession of handguns is at 28%, while 48% favor banning semi-automatic guns known as assault rifles. These results underscore the complexity of Americans' attitudes toward guns: high levels of support for certain restrictions on gun sales, and low levels of support for banning specific types of guns. Americans are not sanguine that new gun laws would reduce mass shootings. Less than half of Americans believe new laws would reduce mass shootings a "great deal" or "moderate amount." Just as many say new laws would have no effect. Previously, roughly three in 10 said that background checks specifically would have no effect on lowering the risk of mass shootings. If new gun control laws were passed, do you think it would reduce the number of mass shootings in the U.S. a great deal, a moderate amount, a little or not at all? There are huge differences in Democrats' and Republicans' beliefs in the efficacy of new gun laws. 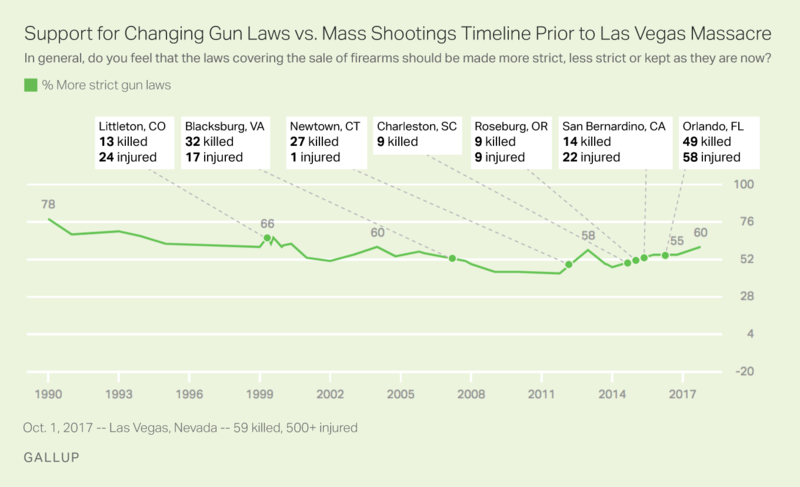 Republicans' overwhelming view that new laws would have no effect on curbing the incidence of mass shootings helps explain the underpinnings for their reluctance to consider such new laws. Gun control appears to be a classic wedge issue for a minority of voters. A quarter of U.S. registered voters say they would only vote for a candidate who agrees with their position on gun control. This is somewhat higher than in the late 1990s and in 2000, but little changed from two years ago. Republicans and Democrats are roughly equal on this measure, meaning the "wedge" factor can come from both the left and the right in future elections. Few Americans name gun violence or the need for stricter gun control as one of the most important problems facing the country today. Overall, the data suggest that elected officials considering legislation to revise existing gun laws or create new, stricter laws will meet with a generally positive response from the American public, taken as a whole. Support will be particularly high for new regulations on gun sales and for the close monitoring of their possession, rather than for the outright ban of certain types of guns. The need for stricter gun laws, however, is not considered one of the most important problems facing the nation, and the significant majority of Americans do not view a candidate's position on the issue as the sole determinant of their vote. A critical discussion point is the public's view of how effective new gun laws would be in preventing mass shootings in the future. Fifty-five percent of U.S. adults favor the death penalty for convicted murderers, the lowest Gallup has measured in more than 40 years. 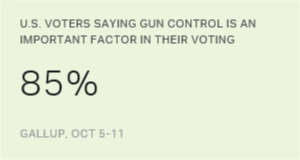 Most U.S. registered voters say gun control plays an important role in how they vote, but just 24% say a candidate must share their views on the issue.